Defender Lewis Dunk has his sights set on getting in the England team after signing a new contract with Brighton on Friday. 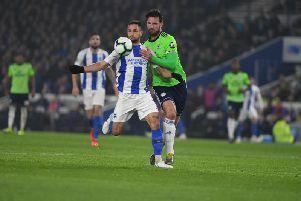 The 26-year-old penned a new five-year deal until the summer of June 2023, along with central defensive partner Shane Duffy, who also signed a new long-term contract. Dunk, who has made more than 200 appearances for the Seagulls, said: “My individual goal would be to get into the England team one day, but you don’t do that unless you’re performing well every week. Looking ahead to the rest of the season, Dunk said: “We need to focus on staying in the league again this season and build again in the summer. "Hopefully we can establish ourselves in the division and see if we can sneak up into the top half of the table. You never know what could happen."